Today's recipe post is brought to you by Anneliese and Lovella. Is making a pie crust still a mystery for you? Anneliese is showing just how easy it can be in her video at the bottom of this post along with a quick single crust recipe for you to try with Lovella's easy peasy apple pie. I posted this recipe a long time ago on my personal blog long before MGCC was started. I want to share it with you today because it is an easy pie everyone can make. If you don't have time to make your own pastry, purchase a frozen crust and put this pie together in minutes. Apples are never better than this time of year so take advantage of this delicious pie. Fill unbaked pie shell with wedges of apples arranged in a concentric circle. Sprinkle with the brown sugar and drizzle evenly with whipping cream. 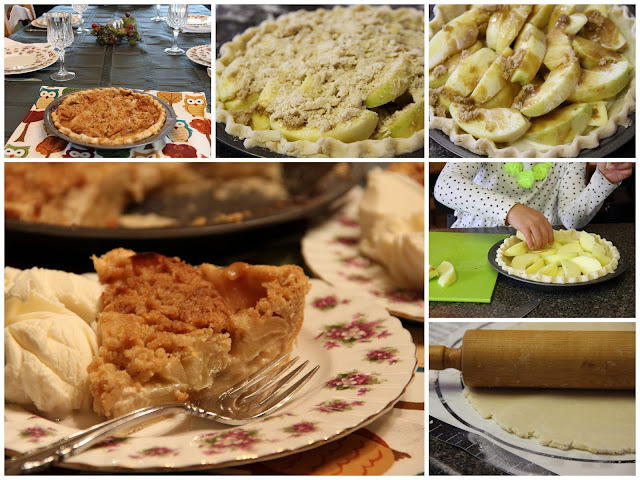 Combine streusel ingredients with fingers or pastry cutter and drop evenly over apple filling. Bake for 15 minutes on bottom rack, reduce oven temperature to 375 and continue baking for 45 - 60 minutes or until topping is golden brown. Let cool on wire rack and serve with ice cream. When mixing a double crust, I like to use half butter and half shortening or lard. This may revolutionize apple pie baking for me. I know a willing volunteer to test the results. Anneliese is so cute and did such a great job on the video. I saw something I have been doing incorrectly right away so thanks so much! Anneliese, you're a great teacher - I'd given up making pies - my pastry always fell apart. After watching you at Lepp Farm Cooking classes, I'm not afraid of it any more. Thanks for today's review on that lesson learned. Do you have a favourite apple to use for your apple pies? I have tried with many different ones and Macs are horrible IMO, just curious what your favourite apple or apples might be for pies. Love the tutorial, so very simple. Tracey, there are lots of good apple varieties good for baking. Early spring I like to use Transparent. The apple tree in our yard is Jonagold and it makes great pies and also is great for apple sauce. I would recommend that if you live where apples grow locally, stick with those as they will be the freshest. Living in Northern Ontario, we don't have apples locally. We do get an apple truck that comes up from Southern Ontario once a week every fall. I have used honey crisp, granny smith, empires and courtlands oh and of course northern spy. They have all been decent. Will have to see if they have the ones you mentioned. They are usually picked fresh then driven up so we can get them a day after picking which is still quite fresh.Tried macs and it just turned to apple sauce almost in the pie, no chunks left at all.